The other day Jim told me he talks to the trees!! It might be time to make him an appointment 😉 Probably only a concern if he thinks they answer. 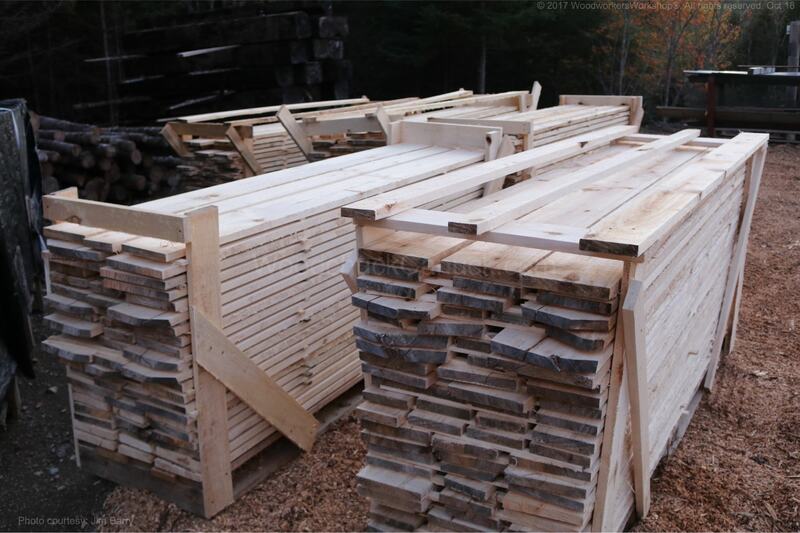 Before we could start milling the hemlock and pine logs we got a few weeks ago, we had to mill the spruce we got earlier in the year. The moisture content of materials plays a roll in woodworking, especially when your woodworking projects will be used indoors. 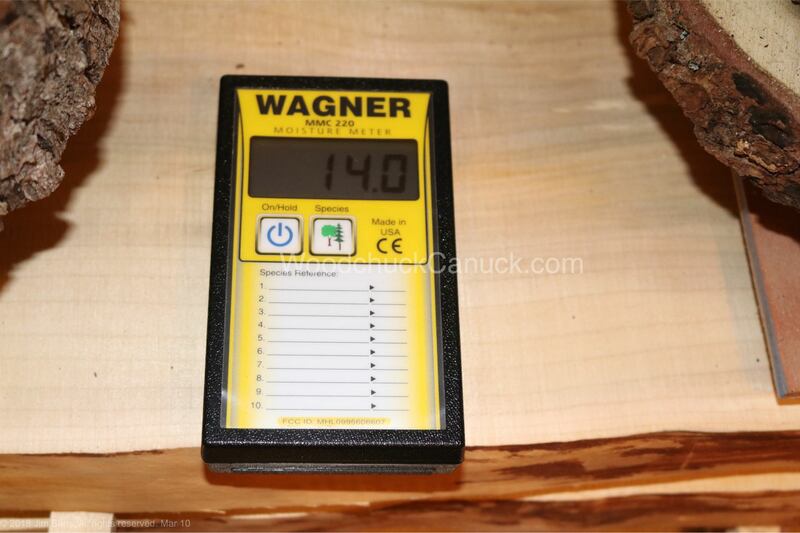 Generally speaking, most woodworkers prefer their wood material to have a moisture content of about 8%. For furniture making, I can see the importance of that. For crafts however, I feel you can go with a higher moisture content. 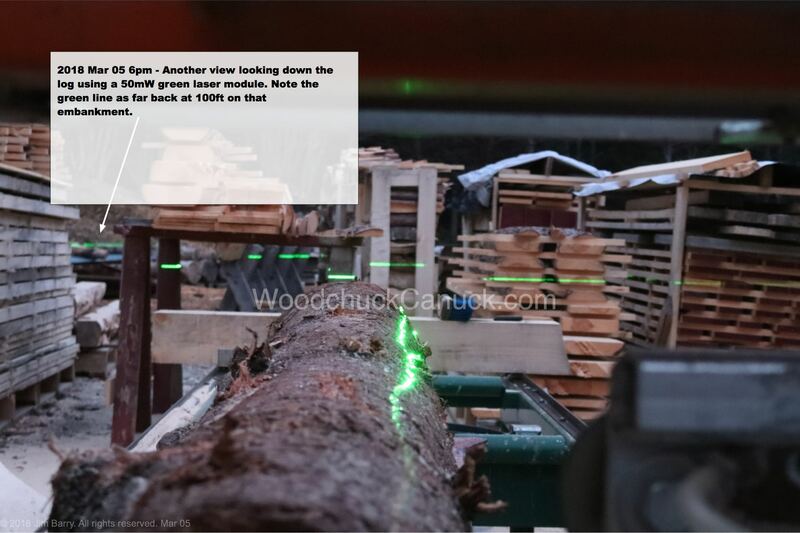 A laser beam allows a sawyer to see on the log where the blade will travel before starting the cut. 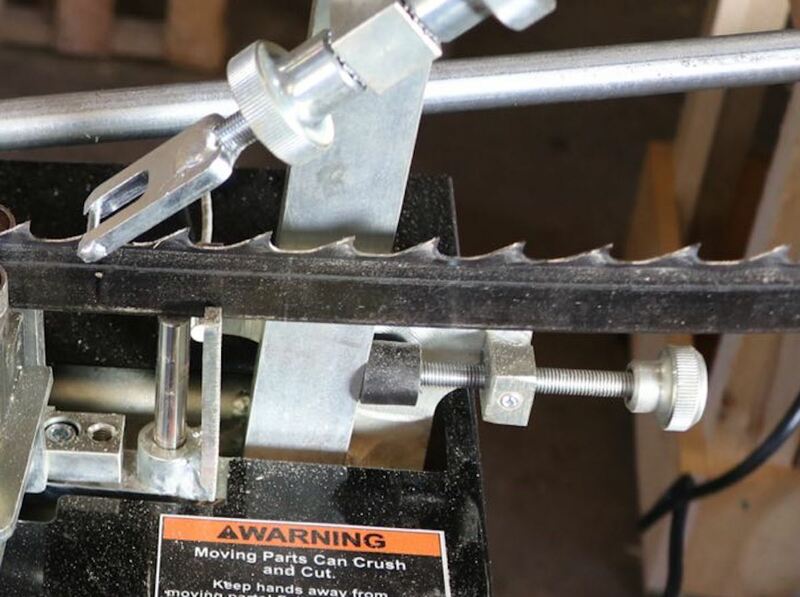 This can be handy as it will save some time when cutting crooked logs or when you want specific features added to, or cut from, live edge slabs. Laser beam kits are available for many of the bigger, more expensive saw mills but for our small manual mill, no luck. Time to make up a DIY kit. Beam me up! On Mondays post I showed you the beginnings of the kiln shed. Last fall we prepared the base, no easy task getting things level, and last weekend Jim got started on the walls. One of the basic components to sawmills is the drip tank, aka the lube tank. 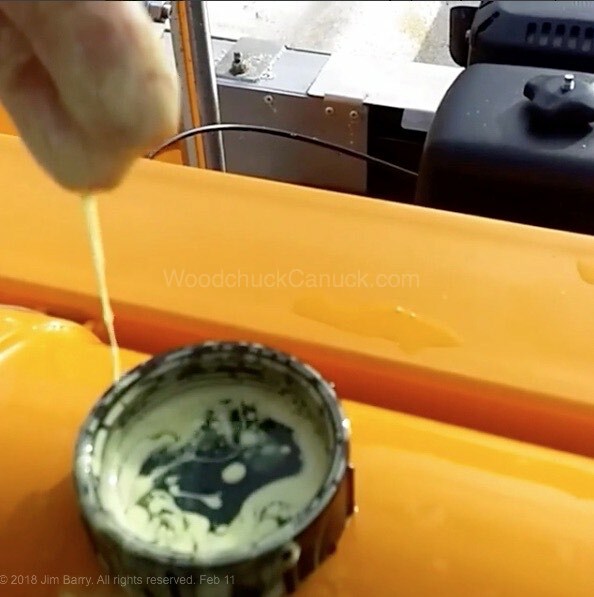 It provides water (or other mixture) that drips onto the blade while slicing through the wood. In essence, it lubricates and helps cool the blade; the lube makes it easier on the engine pulling the blade through the wood and the cooling helps keep the blade in better condition. Don’t use wax based windshield washer fluid in cold temperatures. As you can imagine, you have to have quite a few bandsaw blades on hand if you plan to run a saw mill. 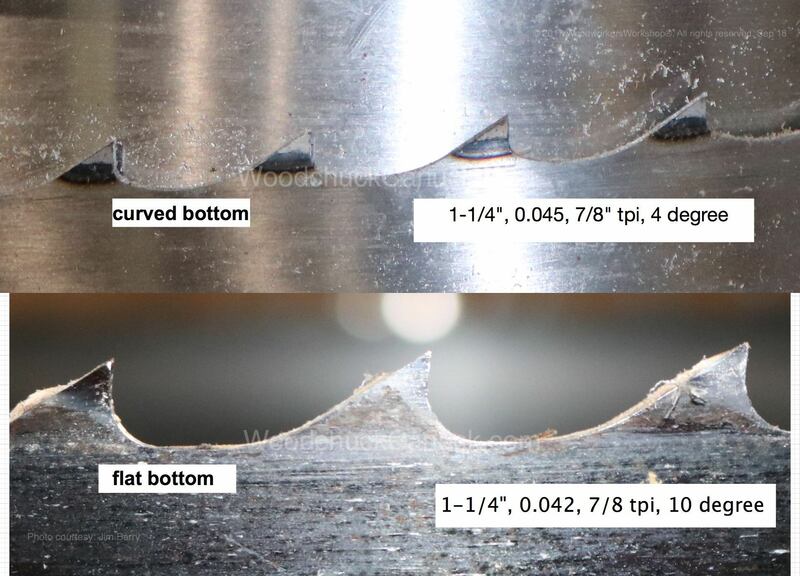 We estimate we get 300 – 500 board feet of lumber cut when the blade starts getting dull. One of the services I will be providing in the coming months for other sawyers is to sharpen bandsaw blades. There are two primary bits of equipment to perform that task, a ‘setter’ and a ‘sharpener’. 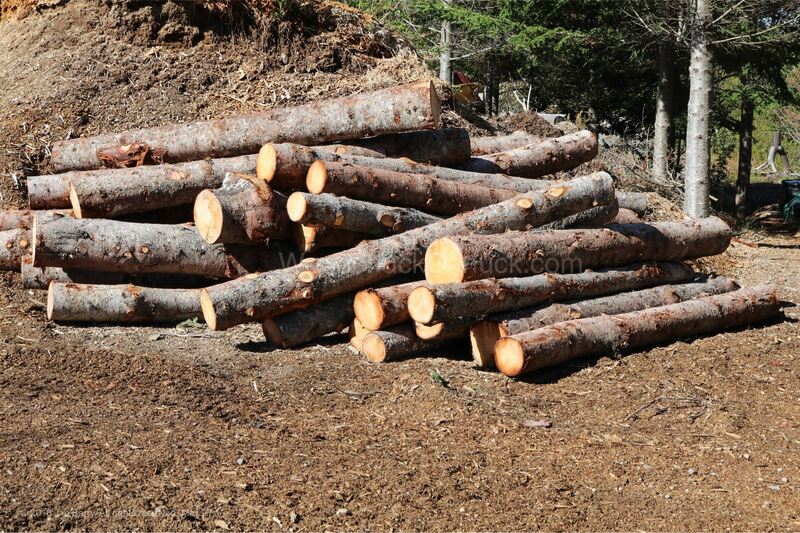 Poplar logs are done… finally. Annnndddd the poplar logs are done! About 93 logs and we got enough to board and batten the 40ft shipping container as well as these 5 crates of 1″ boards and one tall crate of bigger boards ( mostly 2×10’s, 2×12’s). I have been trying out some different band saw mill blades this past month. The blade on the bottom having already gone through the mill, past due for sharpening, the result of this newbie sawyer not knowing when to stop and change the blade. The top blade is a different brand, new out of the box and ready to start cutting. 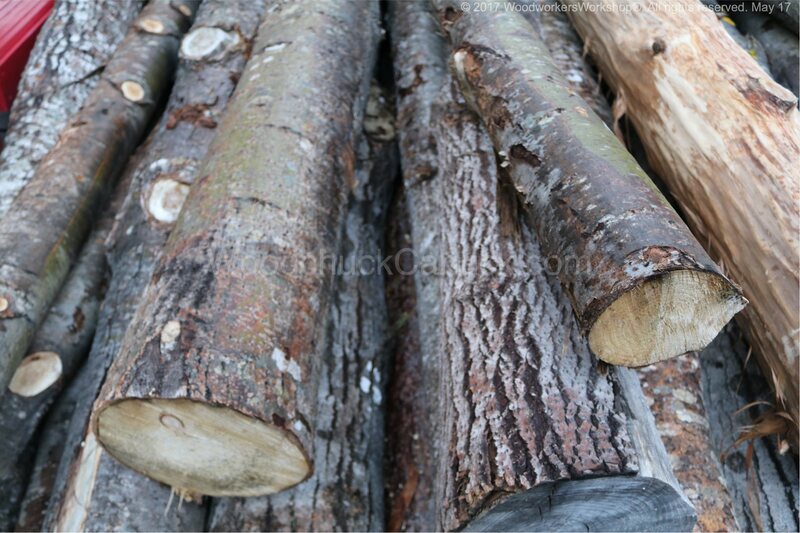 I got some balsam poplar logs in the yard this week. I’m going to mill up most of it for lumber but I might try a few other projects with it. Has anybody used it for woodworking projects?